Noni fruit and juice. Commercial noni juice excludes the pulp pictured here. 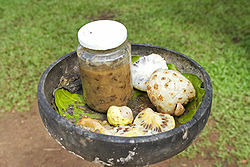 The FDA letter also cited 1) absent scientific evidence for health benefits of the noni phytochemicals scopoletin and damnacanthal, neither of which has been confirmed with biological activity in humans, and 2) lack of scientific foundation for health claims made by two proponents of noni juice, Dr. Isabella Abbot and Dr. Ralph Heinicke. ^ a b "Noni Plant". American Cancer Society. 1 November 2008. Retrieved 20 September 2013. ^ a b Breen, Charles M. (August 26, 2004). "Warning letter from the FDA to Flora, Inc" (PDF). ^ "Noni Tahitian Plus" (PDF). Fda.gov. 2009-04-30. Retrieved 2011-07-09. ^ "Cyber Warning Letter". Fda.gov. 2009-04-30. Retrieved 2011-07-09. ^ European Commission Health and Consumer Protection Directorate-General (December 11, 2002). "Opinion of the Scientific Committee on Food on Tahitian Noni juice" (PDF). ^ Pawlus AD, Su BN, Keller WJ, Kinghorn AD (December 2005). "An anthraquinone with potent quinone reductase-inducing activity and other constituents of the fruits of Morinda citrifolia (noni)". J. Nat. Prod. 68 (12): 1720–2. doi:10.1021/np050383k. PMID 16378361. ^ Millonig G, Stadlmann S, Vogel W (April 2005). "Herbal hepatotoxicity: acute hepatitis caused by a Noni preparation (Morinda citrifolia)". European Journal of Gastroenterology & Hepatology. 17 (4): 445–7. doi:10.1097/00042737-200504000-00009. ^ Dodd, D. E.; Layko, D. K.; Cantwell, K. E.; Willson, G. A.; Thomas, R. S. (2013). "Subchronic Toxicity Evaluation of Anthraquinone in Fischer 344 Rats". International Journal of Toxicology. 32 (5): 358–367. doi:10.1177/1091581813501701. PMID 23966314. ^ "EFSA re-assesses safety of noni juice". European Food Safety Authority. 6 September 2006. Retrieved 24 September 2014. ^ a b c "Noni". National Center for Complementary and Integrative Health, US National Institutes of Health. April 2012. Retrieved 24 September 2014. ^ "France warns consumers off noni juice". Nutraingredients.com. Retrieved 2011-07-09. ^ "Press release: National Food Agency warns about illegal noni products - Finnish Food Safety Authority Evira". Evira.fi. Retrieved 2011-07-09. ^ Yüce B, Gulberg V, Diebold J, Gerbes AL (February 2006). "Hepatitis induced by Noni juice from Morinda citrifolia: a rare cause of hepatotoxicity or the tip of the iceberg?". Digestion. 73 (2–3): 167–70. doi:10.1159/000094524. PMID 16837801. ^ West, B. J.; Jensen, C. J.; Westendorf, J.; White, L. D. (2006). "A Safety Review of Noni Fruit Juice". Journal of Food Science. 71 (8): R100. doi:10.1111/j.1750-3841.2006.00164.x. ^ Thomson Healthcare (Micromedex) (November 25, 2006). "Tahitian Noni Juice". University of Hawaii (2006). "The Noni Website". Thomas, Chris (August 30, 2002). "Noni No Miracle Cure". Cancerpage.com. Archived from the original on June 26, 2008. This page was last edited on 7 December 2018, at 05:43 (UTC).